U.S. auto giant General Motors has announced the closure of practically all of its production facilities in Russia. Meanwhile, sales of other foreign brands in Russia have seen a 30-40 percent decline since the beginning of the year. Industry observers see little reason for optimism on the market and are not ruling out further cuts to production. General Motors has announced that it is to halt production at its three plants in Russia by the end of 2015, following a collapse in the car market linked to the unstable financial situation in the country. From now on, the American multinational will sell only imported vehicles on the Russian market. Furthermore, its model range will feature only premium-class vehicles: the whole of its Cadillac line-up plus the Chevrolet Tahoe, the Camaro, and the Corvette. Cheaper Chevrolet models and the whole of the Opel line-up will not be sold in Russia at all. According to the European Business Association (EBA), Opel and Chevrolet sales in Russia began to fall back at the end of 2013. 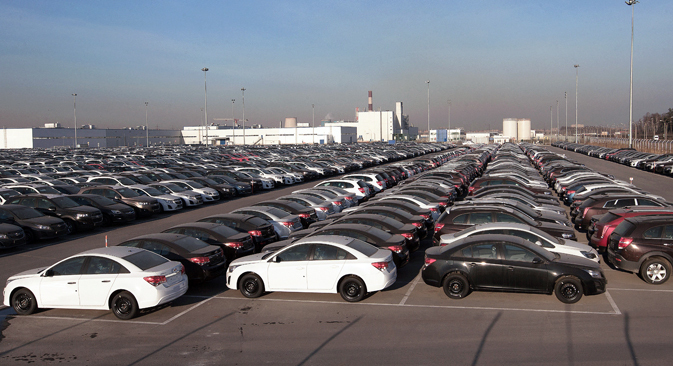 In 2014, sales of Opel and Chevrolet models in Russia dropped by 20 and 29 percent, respectively. At the start of 2015, sales for both makes collapsed altogether, according to EBA data. In February, Opel losses exceeded 80 percent; for Chevrolet the figure was over 70 percent. Sergei Litvinenko of professional services giant PricewaterhouseCoopers (PwC) believes that GM may resume its production in Russia but only in 18-24 months’ time, when PwC expects growth to resume (GM has already had a similar experience: The concern closed its production in Russia in 2001 and returned to the market in 2008). For the time being, the expert continues, GM’s share of the market will be divided between its Korean and Japanese brands. In early 2015, the import of cars from countries outside the former Soviet Union dropped by 42 percent, according to the Federal Customs Service (FCS). At the same time, the Russian Sollers plant has announced the suspension of the Russian production of SsangYong SUVs. However, unlike the Americans, the South Korean company is not quitting the Russian market. Production and import will be restored only after the current stocks have been sold and the ruble has become stable again, said Sollers deputy director Zoya Kaika, who is also a SsangYong representative. “Temporarily freed capacities will be kept busy by increasing Mazda assembly,” said Kaika. SsangYong sales in Jan-Feb 2015 dropped by 61 percent. The South Korean brand is fast losing its share of the market too: After falling from 1.2 to 1 percent last year, it continued its decline in the first two months of 2015, sliding to just 0.5 percent. The main factor fuelling the drop in sales in early 2015 is the rise in prices introduced by car makers in response to the ruble rate fluctuations (by 30-50 percent). The worst affected are foreign makes that are not produced locally but are imported from abroad and vehicles in the mid-price range. “These vehicles were sold at completely different prices – around 40 percent was added to the price tag. Consumers are not ready for that. Budget-friendly cars and premium-segment vehicles were the least affected,” said Dmitry Plekhanov, an expert with the Institute of Comprehensive Strategic Research. EBA statistics would appear to bear out Plekhanov’s conclusion: Since the start of 2015, sales of the German Mercedes-Benz and BMW models have in fact grown by 18 and 3 percent respectively. There are currently some 20 automotive plants in Russia. In experts’ estimates, the establishment of local production makes sense only at volumes of at least 100,000-150,000 vehicles a year. “Manufacturers do not believe that the market is going to start quickly picking up in 2016. Some, like GM, will choose to leave the market. This move is likely to be limited to US companies, which had it the toughest on the Russian market,” said Plekhanov. Plekhanov points out that Chinese car makers have recently been engaged in many talks on expanding their presence on the Russian market, but now these attempts may again be frozen. “The others may prefer a temporary reduction in production and unification with other producers,” he said.